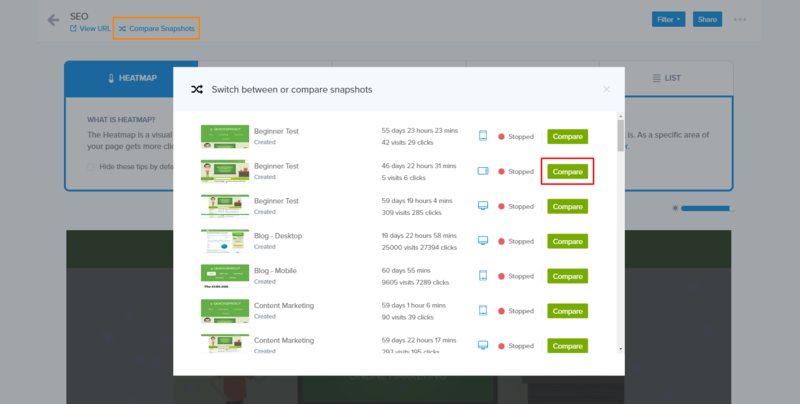 Comparing snapshots is a great way of gauging if changes made to a page are performing as expected; or comparing the results of the desktop version to the mobile version of the page. 1. While viewing the results of one of your snapshots, click on the snapshot name drop-down (in the top left-hand corner) to reveal a list of all your snapshots. Locate the snapshot you'd like to compare with and click Compare. 2. This will show both snapshots side-by-side for comparison.